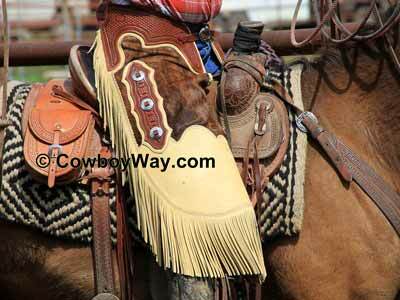 Below are cowboy chinks, also called Western chinks, for sale on eBay. You will sometimes also find a few chaps. Please scroll down to read a short article on the difference between chinks and chaps. Below are chinks for sale. Want to narrow your seach? 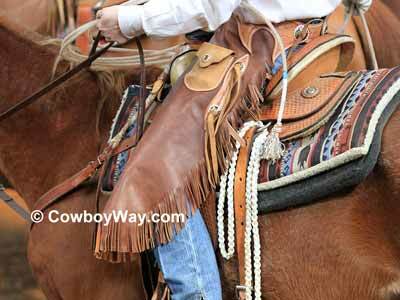 Cowboy Chinks and Chaps - What's The Difference? 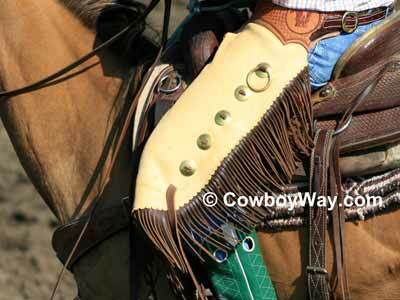 Chaps and chinks are leather leg coverings worn by horseback riders – typically cowboys and cowgirls – as protection against weather, timber, brush, rope burns, and other hazards. They are buckled around the waist, and are open in the back so a rider’s seat is not covered. Chaps run the full length of the rider's legs. They are often closed around the leg by a zipper, but other fasteners might be used. The two most common styles of chaps are shotgun and batwing. Modern shotgun chaps are usually made with a zipper or other fasteners running from the top of the leg to the bottom to make them easy to put on and take off. Older shotgun chaps - or new ones designed on an older style - might be enclosed from top to bottom requiring the rider to step into them like a pair of jeans. Batwing chaps are fuller cut than the shotgun style. After being fastened around the legs, batwings will have a generous amount of leather that overlaps the closure. 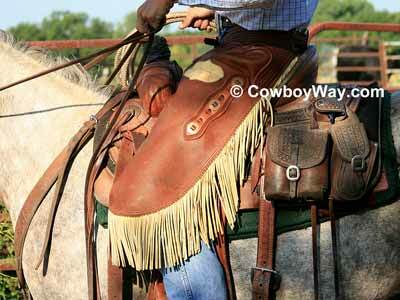 Many working chaps are the batwing style, and they are also the most common style (or a variation of this style) for rodeo chaps. Chinks are similar to chaps, but are shorter, typically hitting the rider below the knee but above the ankle. They are fastened behind the rider’s legs by snaps, buckles, zippers, or other fasteners, but the fasteners stop above the back of the knee, allowing the chinks to move more freely from that point downward. The fringe on chinks is also usually longer and more prominent than fringe found on chaps. Chinks with tooling, and hair on the hide on the top half. Chinks with initials, a ring for a tie strings, and contrasting fringe. These chinks a covered pocket and shorter fringe. Medium chinks with contrasting fringe and a slit pocket. "Chinks" are pronounced with a hard "ch" sound as in "cherry" or "chipmunk." This might be worth mentioning because chaps, another type of cowboy legging, are pronounced with a soft "ch" and thefore are pronounced "shaps." New to eBay? Learn about buying!